Description: In 1989, the Berlin Wall fell; shortly afterwards the two Germanies reunited, and East Germany ceased to exist. In a country where the headquarters of the secret police can become a museum literally overnight and one in 50 East Germans were informing on their fellow citizens, there are thousands of captivating stories. Anna Funder tells extraordinary tales from the underbelly of the former East Germany. She meets Miriam, who as a 16-year-old might have started World War III; she visits the man who painted the line which became the Berlin Wall; and she gets drunk with the legendary "Mik Jegger" of the east, once declared by the authorities to his face to "no longer to exist." 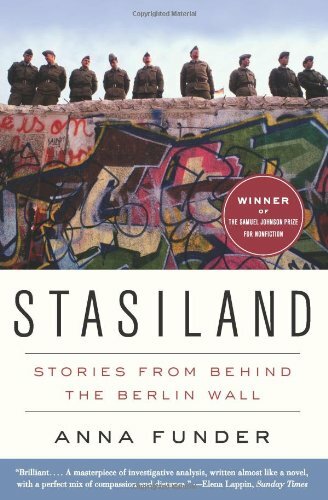 Each enthralling story depicts what it's like to live in Berlin as the city knits itself back together or fails to. This is a history full of emotion, attitude, and complexity. "I can only describe it as horror-romance. It's a dumb feeling, but I don't want to shake it. The romance comes from the dream of a better world that the German Communists wanted to build out of the ashes of their Nazi past; from each according to his abilities, to each according to his needs. The horror comes from what they did in its name." "We laugh at the improbability of it, of someone barely more than a child poking about in Beatrix Potter's garden by the wall, watching out for Mr McGregor and his blunderbuss, and lookng for a step-ladder to scale one of the most fortified borders on earth. We both like the girl shew was, and I like the women she has become." "The hairs on my forearms stand up. I have stopped looking at Julia now because in this dimness she ceased addressing her words to me some time ago. I am humbled for reasons I cannot at this moment unravel. I am outraged for her, and vaguely guilty about my relative luck in life."